The Boulder Loop Trail is a scenic hike through a boulder field and out to a ledge viewpoint on the side of the Moat Range. The trail starts near a campground. From the parking area, cross the road and head into the woods. After a 0.2 mile walk, the trail splits into a loop. Bear left onto the west fork. 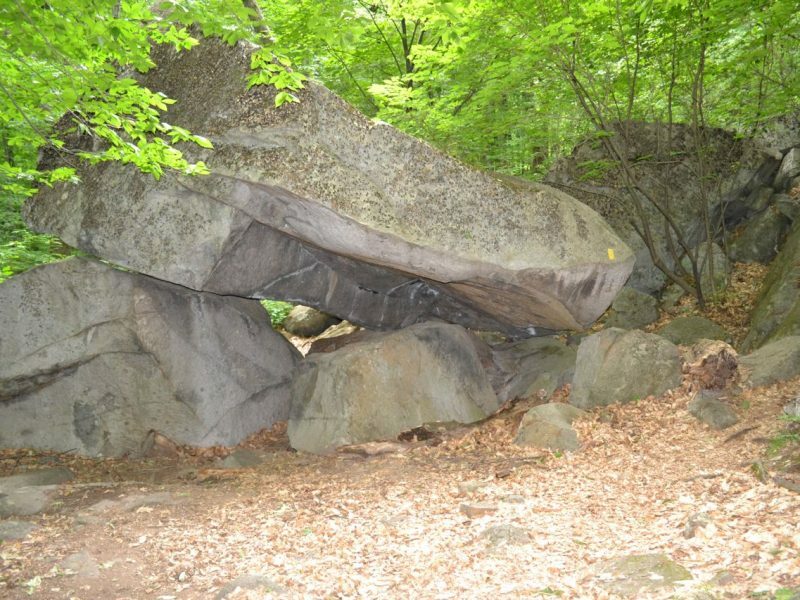 From the split, you will start to see many small boulders along the trail. The trail soon turns a corner to face an enormous cliff. It climbs alongside the cliff before making a few short switchbacks and heading straight uphill. After 0.6 miles of climbing (since the loop junction), the trail comes out to a small ledge from which you can look up at your destination. Going back into the woods, the trail runs flat for a short distance before swinging around behind the main ledge and ascending from the back, 0.5 miles past the first viewpoint. 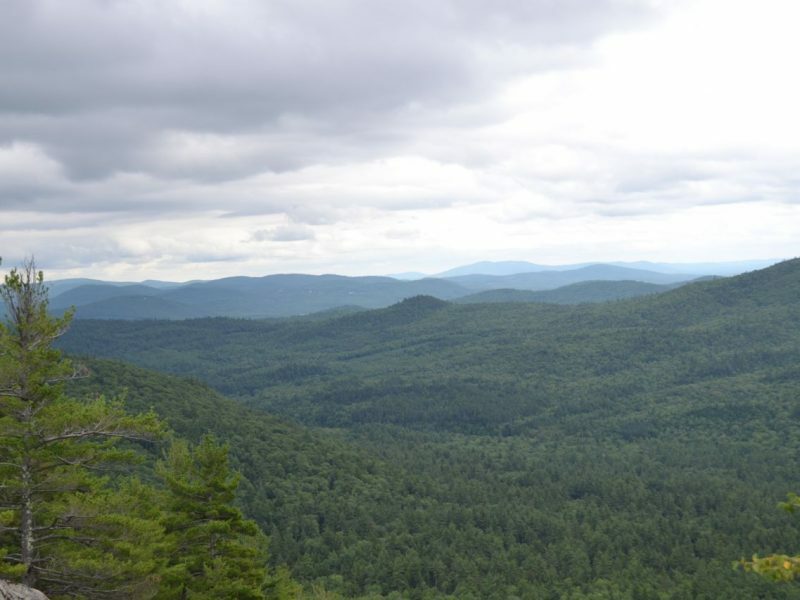 At the top, a spur trail leads 0.2 miles down along the ledge to an overlook. From the overlook, there is a fine view of Mt. 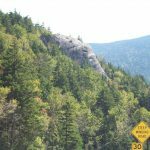 Chocorua and both directions down the valley of the Kancamagus Highway. 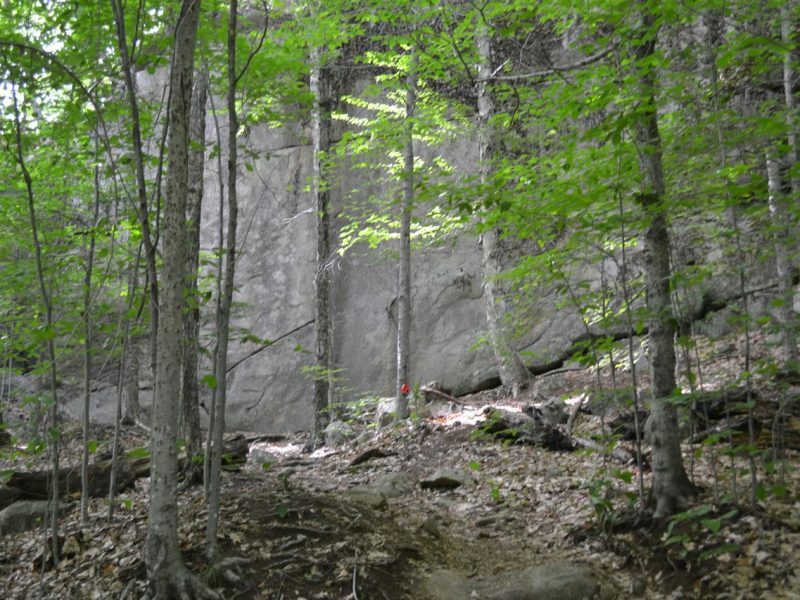 When finished exploring the ledges, return to the trail and continue down the other side of the loop. This side is easier than the way up, as there are stone stairs. 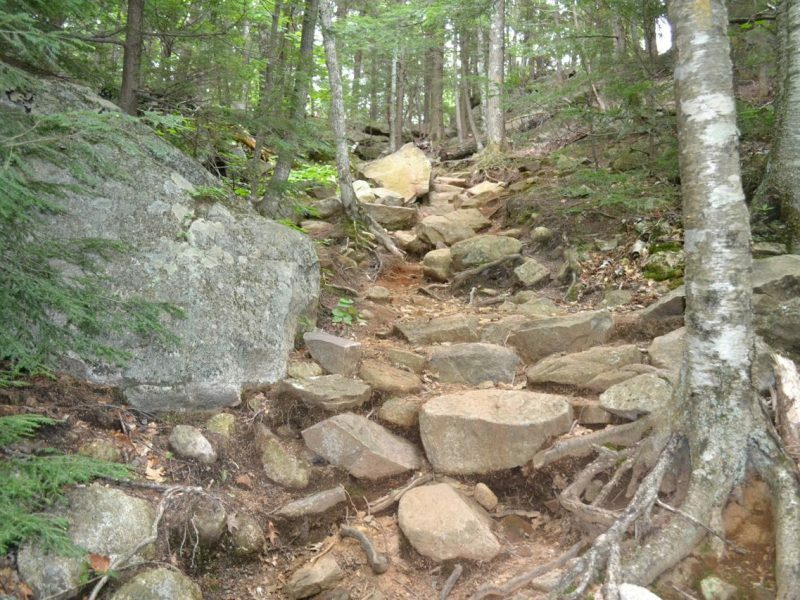 After a long descent, the trail enters the boulder field again, where there are more interesting rocks. 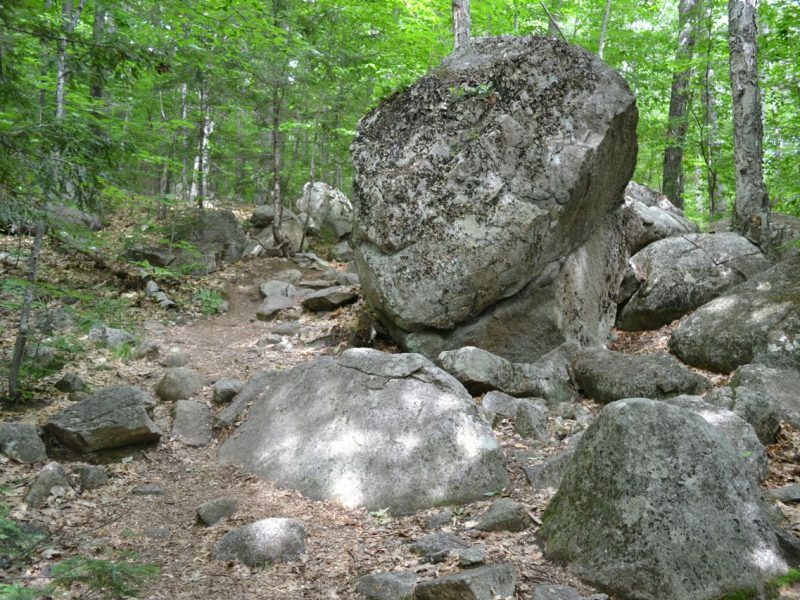 This is a loop hike through the woods with lots of large, interesting boulders. 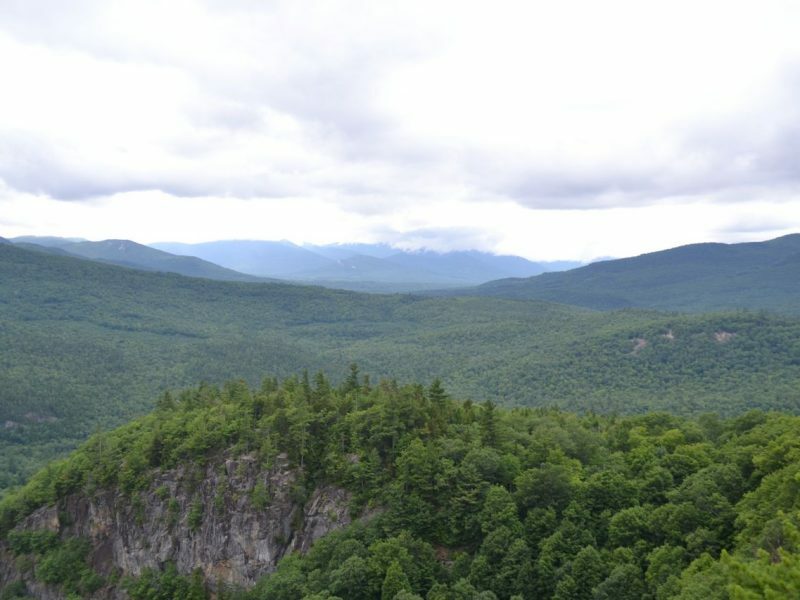 Several ledges offer great views of the many surrounding mountains. Excellent views for relatively little effort. The parking area is on the right and across the covered bridge. Turn right to stay on Passaconaway Road, then immediately turn right again into the parking area. Trailhead and parking area are on Passaconaway Road in Albany, NH. Passaconaway Road leaves the Kancamagus Highway about 6 miles west of Rt. 16 and 29.2 miles east of Rt. 93. This road is marked with a brown sign for the Covered Bridge Campground and the hiking trail. Drive down this road, past the parking area on the right and across the covered bridge. Turn right to stay on Passaconaway Road, then immediately turn right again into the parking area.